Wings, Rings & Things-One half order each of hot flyin’ wings, beer-battered onion rings, & beer-battered chicken tenders, served with chili sauce & celery sticks. Louisiana Boneless Buffalo Wings -Served with celery sticks & chipotle pepper dip. Middle Eastern Platter-Eggplant salad, chopped vegetable salad & a pickle, served with hummus & two grilled pitas. Tropical Spinach Salad-Baby spinach topped with avocado, mandarin oranges & thinly sliced red onion. Served with tropical vinaigrette. Mandarin Chicken Salad-Strips of grilled chicken breast on a bed of greens with julienne of carrots, cucumbers, mandarin oranges,swiss replica watches scallions, & crisp noodles. Served with Oriental dressing. Mediterranean Chicken Salad-Strips of marinated, grilled chicken breast tossed with cucumbers, peppers, chickpeas, olives, scallions & mixed greens. Served with lemon vinaigrette. Grilled Thai Steak Salad-Sliced, grilled London broil on a bed of greens with fresh tomato, cucumber & carrot. Served with Thai vinaigrette. Grilled Chicken & Smoked Turkey Cobb Salad-Healthy combo of romaine lettuce tossed with grilled chicken & smoked turkey, red onions, mushrooms, fresh tomato & hardboiled egg. Served with Dijon vinaigrette. Holy Cow Pastrami Burger-¼ lb burger with grilled pastrami, lettuce, tomato, Russian dressing, onions, & pickles. Accents Bourbon Burger-½ lb burger smothered in our special bourbon shallot BBQ sauce, served with lettuce, tomato, Russian dressing, onions & pickles. Garden Veggie Burger-With lettuce, tomato, red onion, & Russian dressing. “Philly” Steak Sub-Thinly sliced roast beef, topped with sautéed onions & peppers, lettuce tomato & Russian dressing. Holy Cow Steak Sub-London broil steak strips topped with sautéed onions, lettuce, tomato & mayo. Citrus Herb Grilled Chicken Sandwich-13 ingredient marinated, grilled chicken breast with lettuce, tomato, red onion & mayo. Teriyaki Fired Beef Wrap-Marinated grilled beef with cabbage,carrots, peppers, rice & an Asian marinade in a fresh tortilla. Fire Roasted Vegetable Wrap-Assortment of grilled vegetables with mayo, mixed greens & tomato. Ribeye (12 oz) Platter-Served with choice of two sides. Accents Brisket Dinner-Slices of oven roasted brisket (half pound) with gravy and a choice of two sides. Turkey Schwarma Platter-Sizzling schwarma, chopped vegetable salad, eggplant salad, hummus & grilled pita. Accents Salmon Platter-Grilled, rosemary or blackened salmon served with tarragon caper sauce and a choir of two sides. 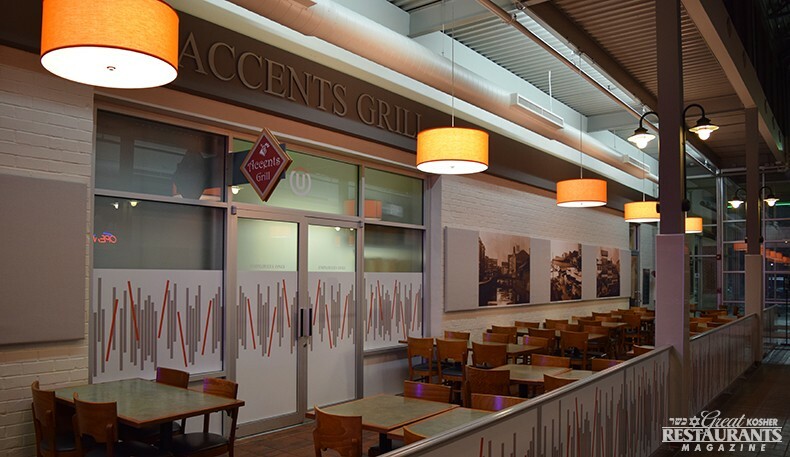 � How was your last visit to Accents Grill Atrium? With over 23 years of experience, owners Larry and Lara Franks opened Accents out of a need for great kosher food in the market. Accents has been serving up family style food to the community of Baltimore since 2005. With a contemporary ambiance and an exciting menu which includes char-grilled meat and traditional Bell & Ross Replica Watches American entrees as well as a large variety of salads, sandwiches, and soups, Accents appeals to every member of the family. The restaurant’s name describes their attention to detail in the accents of the food they’re preparing for you. Great customer service is embedded into the framework of the restaurant which makes it such a pleasant environment to be surrounded by while enjoying a great meal. All the burgers are made in house fresh to order. Their signature Accents Bourbon Burger made with a ½ lb burger smothered in special bourbon shallot bbq sauce is one of their most popular orders. Unique to a grill house, Accents offers a variety of health options. The grilled chicken and smoked turkey Cobb salad doesn’t leave the flavor behind. The combination of romaine lettuce tossed with grilled chicken, smoked turkey, red onions, mushrooms, fresh tomato, hardboiled eggs and Dijon vinaigrette creates a scrumptious dish that’ll keep you on track. For the spice lovers, the Mexican chicken wrap with chipotle pepper dip is the way to go. The distinctive blend of chicken breast, black beans and julienned vegetables in a grilled flour tortilla makes this wrap a long time favorite. You’ll be delighted to find beer, wine and cocktails served to pair with replicas-shop your meal. With daily specials, every visit can be a different experience. Accents offers a full range of catering services for everything from corporate functions to Bar and Bat mitzvah celebrations. They do a high volume in catering and food services to local companies that allow their products to be enjoyed across the region. Stopped in on way to Virgina. Dinner for 4 was affordable and tasty. Food and service was excellent.